If a suspect leaves a trail of footprints at a crime scene then they are probably very close to being caught. Footprints are highly incriminating evidence and yet they present some major challenges to investigators as they can easily be damaged. In a completely different context palaeontologists are also needing to analyse footprints – studying ancient fossilised dinosaur footprints in order to understand what types of dinosaur were present at a particular site. Researchers at Bournemouth University have developed an innovative new software tool called DigTrace which addresses the problems associated with recording and investigating footprints, using mathematics to capture and analyse footprints digitally. DigTrace uses photographs to produce 3D digital models of the footprints, before automatically comparing them. In the context of a criminal investigation this is usually one from the crime scene and one from a forensic shoeprint database or even a suspect’s shoe. 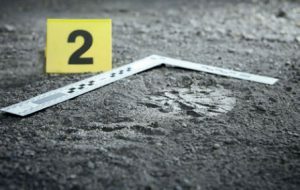 In order to compare the two footprints, the software needs to take the suspect’s footprint and move it so that it is aligned with the crime scene footprint. It does this by applying a combination of translations and rotations until the two footprints are aligned as perfectly as possible. An operator first chooses three or more clear reference points on each footprint such as the tip of the heel, the tip of the big toe and the tip of the little toe. These three reference points are stored digitally as 2D coordinates: (x,y). Currently this is done manually but the team from Bournemouth University are working on automating the process using mathematical techniques involving invariant descriptors and deformable shape models. The DigTrace software then calculates the transformation matrix which is needed to move from the reference points on the suspect’s footprint to the reference points on the crime scene footprint. This transformation matrix can then be applied to the whole of the suspect’s footprint, moving it so that it is aligned as accurately as possible with the crime scene footprint. This makes it possible to establish whether two footprints are from the same shoe and allows the operator to recognise subtle features such as tiny wear marks that make each footprint distinctive. This means that even if you happen to wear the same size and brand of trainer as a criminal, you will have a distinctive footprint which will prevent you from wrongly being convicted. Exactly the same process can be used to compare two different fossilised dinosaur footprints, showing just how versatile and useful this innovative software is.